Truth be told I'm a little bit surprised I haven't heard from our friends over at Antec in a while. I do have one of their cases sitting at home waiting to be reviewed, but all told, 2012 was kind of a quiet year and unfortunately for PC enthusiasts it looks like 2013 may be moving in the same direction. They had their usual quality power supplies on tap, but everything is just inching towards better certification and efficiency anyhow (I know, woe is me). 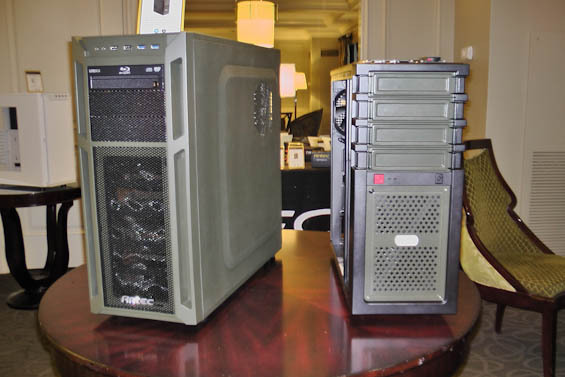 Antec was showing off three cases: two are modified versions of the P280 and Eleven Hundred respectively (both solid offerings in their own right), but the third one completely broadsided me: the GX700. The GX700 is a mostly toolless design and its aesthetic seems to be cut from the same mold as Corsair's Vengeance C70. That may or may not excite you depending on how you felt about the C70's styling, but what got me was the value proposition. Construction is primarily steel and plastic, with smart cable routing mehind the motherboard tray, and the same general ATX case cooling layout, but Antec extruded the top venting of the case slightly and includes two 140mm fans standard. Rear exhaust is handled by a single 120mm fan. I/O is the usual two USB 2.0 ports and two USB 3.0 ports, and there's an integrated fan controller. None of that is hugely exciting until you realize Antec is putting this case on the market for just $59 MSRP. I guessed $119, and at $119 it looks like it would be a fairly competitive enclosure, but at $59 I expect it's going to provide serious competition. Look forward to it. Next to it in the photo is the "new" M-1100. This is a new Eleven Hundred, mostly the same as the old Eleven Hundred (not necessarily a bad thing), but with the one change I really wanted them to make: a pair of 120mm fan mounts (and fans) in the top of the chassis instead of the single 200mm exhaust fan. I was always perplexed as to why the P280 had the mounts for a 240mm radiator and the more gamer-oriented Eleven Hundred didn't, but apparently someone at Antec was too. So there you go. Not pictured is the new white version of the P280, which also features a window on the side. So what has Antec busied themselves with? Launching a new division as it turns out. I have no doubt that there's money to be made in producing excellent mobile peripherals, and Thermaltake and Rosewill have been branching out in the same direction (although to be fair, Rosewill makes everything at this point), but the new Antec Mobile Products (a.m.p) division seems like an oddball fit for an old warhorse like Antec. It remains to be seen how well this focus will work out for them, but I'm mostly sorry to see it back-burnering a case division that was fairly revitalized not too long ago by the P280/Eleven Hundred. 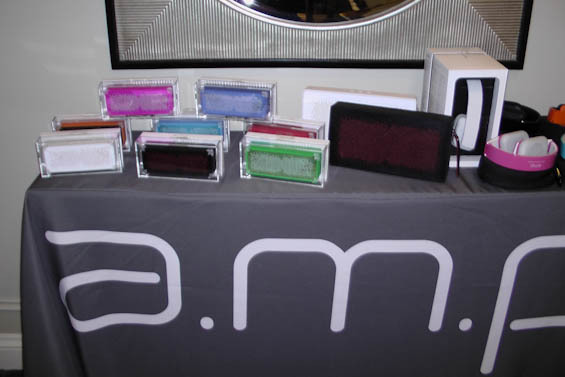 In addition to ear buds and portable speakers, you can get a.m.p branded power peripherals for smartphones and tablets, and Antec does say they include some of their own secret sauce from their power supplies to produce more reliable, higher quality stuff. Hopefully the GX700 will be reviewed soon. Frankly I prefer Corsair's understated look, and I was surprised by the comparison to Vengeance C70. There's something about it, but the initial impression I had was of a significant difference because of how the front looks. I also feel insulted that cases like these - and there are hundreds of them - are marketed for "gamers". This implication that people who play the occasional video game suffer from a complete lack of test is appalling. How many weird, illogical, impratical, over-priced POS products can PC hardware companies produce in a given year? The answer: millions. For every sucker, there is a hundred different useless PC products that they can buy if they are told by some talking head that their life will improve if they just buy one or more of these worthless products.